dig the “Uma” site in Seymour. 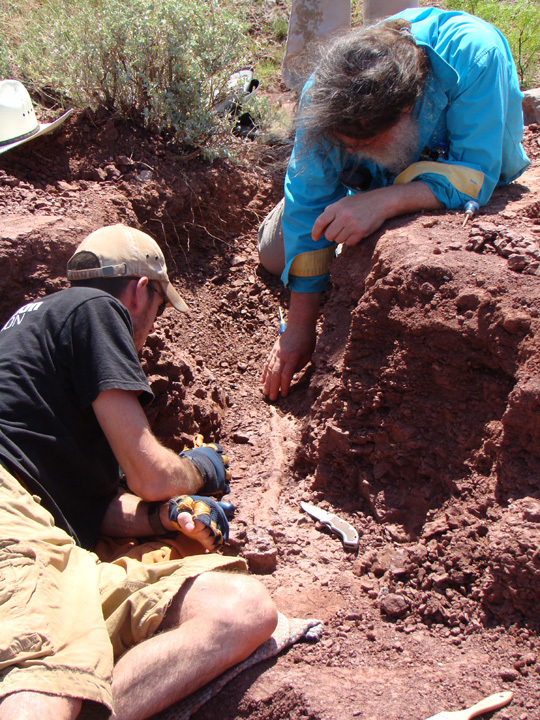 Our paleontology team – led by Dr. Robert Bakker – is back in Seymour, TX this week, digging for Dimetrodon at a site they’ve now been working for several years. (You can read more of what’s been found already in our daily blog from the field in 2007). Chris Flis sent the update on yesterday’s progress – the day was filled with new finds which you can hear all about in the podcast below. In the podcast, Chris also talks about “jacketing” several fossils – this is done when a site yields so many fossils that they can’t safely be excavated in the time the team has available. So, the team digs a trench around the site, covers it with many layers of plaster and burlap to stabilize it, and flips it to cover the bottom. You end up with a giant slab of plaster-encased dirt that can be brought home for further excavation and study. And when I say giant, I mean it – our team has brought home jackets weighing up to 500 pounds. The jacket made for Leonardo, the mummified dinosaur that was found in Montana (which is now on display here) weighed 6 tons! The team’s 2007 blog has a great video of the end of the jacketing process – and a bit more detail in how it happens. What about the really awesome super cool new discovery from this morning? I can’t wait to hear all about it! i was wondering what location you have digged at the most and what tool you use the most. Next Post Live from the Field: Secodontosaurus Found?